Ogura Falls (小倉の滝) is one of waterfalls in Shima Onsen. 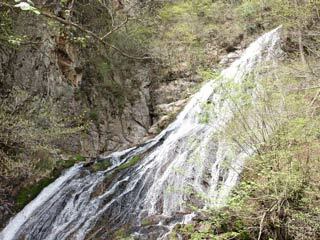 It is also considered as one of the best waterfalls in Nakanojo Town. It is located west side of Shima Onsen, and the valley in front of this falls gives you great hiking in nature. There are bells for avoiding wild bears. When you see them, ring them to aware bears that you are there. Bears will escape when they heard that bells. In Spring, there is beautiful Azalea Flowers around this falls. In Summer, it will be covered with green leaves. In Falls, you can enjoy beautiful autumn leaves. It is located 2.5km away from its parking.